Onshore winds and a weak locally generated windswell left no real options for a surf yesterday, while today poor conditions have continued with a small weak swell. Conditions should become much cleaner and glassy tomorrow morning as winds back off and tend variable (likely swinging locally offshore across both coasts). There won't be much swell around though with 1-2ft sets on the Surf Coast and 3-4ft waves on the Mornington Peninsula through the morning ahead of a slight kick in new long-range W/SW groundswell through the afternoon. Winds will swing SE through the morning though, creating average conditions into the afternoon. Friday will see the inconsistent W/SW groundswell easing from 2ft on the Surf Coast and 3-5ft on the Mornington Peninsula but with lingering SE winds on the Surf Coast and possibly variable tending SE winds on the Mornington Peninsula. Conditions will improve for exposed spots over the weekend, but the swell will remain in the small to tiny range. The Surf Coast is only expected to offer inconsistent 1-2ft sets on Saturday and Sunday while the Mornington Peninsula should offer 3ft to occasionally 4ft sets. E/NE tending SE winds will create OK waves on the Mornington Peninsula Saturday, while Sunday looks the pick with a straighter N/NE breeze through the morning. 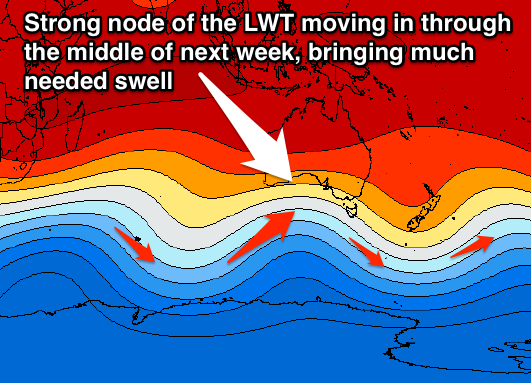 As touched on last update, the blocking setup across the country will break down through early next week and with this we should see a strong node of the Long Wave Trough push east from the Indian Ocean towards us into the middle of the week. A series of vigorous polar fronts will be directed up and into us, generating pulses of W/SW groundswell that will likely reach the large range into the second half of the week. Before this though, the surf will bottom out Monday and Tuesday under fresh N/NE tending NE winds on the former and strong N'ly tending W/NW winds on the later. So super exposed spots will be the only go through Monday. Check back here on Friday for an update on the timing and sizes of the W/SW groundswells due through the middle to end of next week. Everything's falling nicely into place, looking like a very solid swell for the Southern States later next week. Look out for the update tomorrow. i cant make sense of the thickness between nz and new cal. Why does it look like a cold pool is trailing a surface high? Don't the normally trail a front? 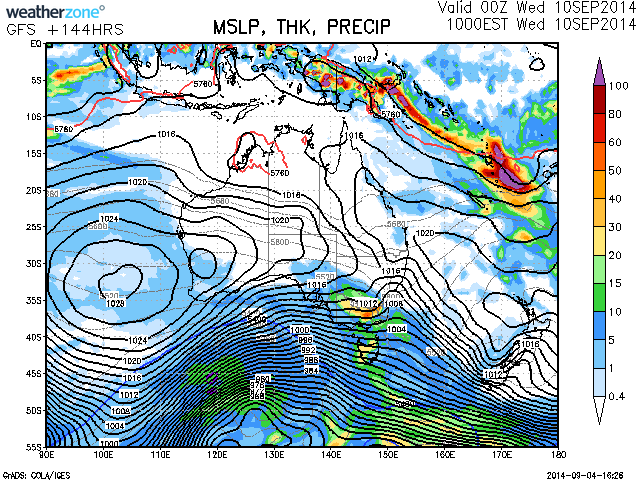 Ah, that's the remnants of the the current cold pool over South Eastern Australia, you can see its evolution here.. Right, thanks. I wonder if a stagnating cold pool can help induce tropical vorticity... We will find out soon enough... thanks again Craig. Hi Craig, Just a quick question why do you use WZ synoptics rather than SN's...? Ah I grabbed this one quickly as it had just updated before our charts. Otherwise would of grabbed the 00z wind forecast and displayed that..